Because when you poke a lot of fracking holes in the ground, it releases methane into the groundwater . . . So, is Dimock’s Water Really Safe to Drink? 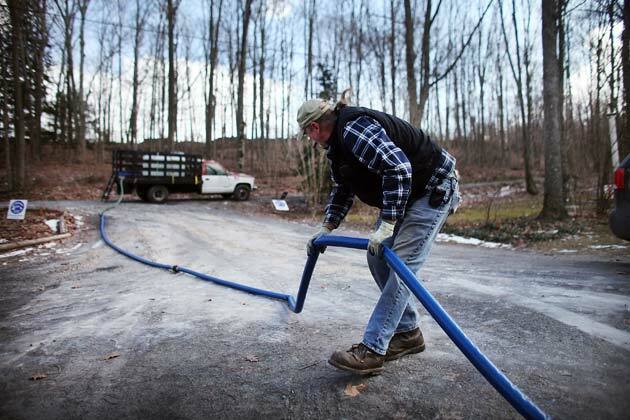 Ray Kemble delivers fresh water to a home that had their water contaminated due to hydraulic fracturing on Jan. 18, 2012 in Dimock, Pa. Photo by Spencer Platt/Getty Images. ProPublica, March 20, 2012, 2:42 p.m. When the Environmental Protection Agency announced last week that tests showed the water is safe to drink in Dimock, Penn., a national hot spot for concerns about fracking, it seemed to vindicate the energy industry’s insistence that drilling had not caused pollution in the area. But what the agency didn’t say – at least, not publicly – is that the water samples contained dangerous quantities of methane gas, a finding that confirmed some of the agency’s initial concerns and the complaints raised by Dimock residents since 2009. Search for how many wells have been drilled and how many gas regulators are in your state. The test results also showed the group of wells contained dozens of other contaminants, including low levels of chemicals known to cause cancer and heavy metals that exceed the agency’s “trigger level” and could lead to illness if consumed over an extended period of time. The EPA’s assurances suggest that the substances detected do not violate specific drinking water standards, but no such standards exist for some of the contaminants and some experts said the agency should have acknowledged that they were detected at all. “Any suggestion that water from these wells is safe for domestic use would be preliminary or inappropriate,” said Ron Bishop, a chemist at the State University of New York’s College at Oneonta, who has spoken out about environmental concerns from drilling. Dimock residents are struggling to reconcile the EPA’s public account with the results they have been given in private. The water in Dimock first became the focus of international attention after residents there alleged in 2009 that natural gas drilling, and fracking, had led to widespread contamination. That April, ProPublica reported that a woman’s drinking water well blew up. Pennsylvania officials eventually determined that underground methane gas leaks had been caused by Cabot Oil and Gas, which was drilling wells nearby. Pennsylvania sanctioned Cabot, and for a short time the company provided drinking water to households in the Dimock area. This January, the EPA announced it would take over the state’s investigation, testing the water in more than 60 homes and agreeing to provide drinking water to several of families – including the Elys – in the meantime. Then, last Thursday, the EPA released a brief statement saying that the first 11 samples to come back from the lab “did not show levels of contamination that could present a health concern.” The agency noted that some metals, methane, salt and bacteria had been detected, but at low levels that did not exceed federal thresholds. It said that arsenic exceeding federal water standards was detected in two samples. But Dimock residents say the agency’s description didn’t jibe with the material in test packets distributed to them, and they voiced concerns about why the EPA had passed judgment before seeing results from nearly 50 homes. Several shared raw data and materials they were given by the EPA with Josh Fox, the director of the Academy Award-nominated documentary “GasLand,” who shared them with ProPublica. However preliminary, the data is significant because it is the first EPA research into drilling-related concerned on the east coast, and the agency’s first new information since it concluded that there was likely a link between fracking and water contamination in central Wyoming last December. The EPA is currently in the midst of a national investigation into the effects of fracking on groundwater, but that research is separate. As the agency has elsewhere, the EPA began the testing in Dimock in search of methane and found it. Methane is not considered poisonous to drink, and therefore is not a health threat in the same way as other pollutants. But the gas can collect in confined spaces and cause deadly explosions, or smother people if they breathe too much of it. Four of the five residential water results obtained by ProPublica show methane levels exceeding Pennsylvania standards; one as high as seven times the threshold and nearly twice the EPA’s less stringent standard. The methane detections were accompanied by ethane, another type of natural gas that experts say often signifies the methane came from deeply buried gas deposits similar to those being drilled for energy and not from natural sources near the surface. Among the other substances detected at low levels in Dimock’s water are a suite of chemicals known to come from some sort of hydrocarbon substance, such as diesel fuel or roofing tar. They include anthracene, fluoranthene, pyrene and benzo(a)pyrene– all substances described by a branch of the Centers for Disease Control and Prevention as cancer-causing even in very small amounts. Chromium, aluminum, lead and other metals were also detected, as were chlorides, salts, bromium and strontium, minerals that can occur naturally but are often associated with natural gas drilling. It is unclear whether these contaminants have any connection to drilling activities near Dimock. The agency says it plans further testing and research. Many of the compounds detected have not been evaluated for exposure risk by federal scientists or do not have an exposure limit assigned to them, making it difficult to know whether they present a risk to human health. Inconsistencies in the EPA’s sampling results also are raising concerns. EPA documents, for example, list two different thresholds for the detection of bromide, a naturally occurring substance sometimes used in drilling fluids, opening up the possibility that bromide may have been detected, but not reported, in some tests. The EPA did not respond to questions about the detection limits, or any other technical inquiries about the test data. A spokesman for Cabot declined to comment on the water test results or their significance, saying that he had not yet seen the data. We have to move beyond the important issue of whether or not methane-tainted water is safe to drink. In part, because some will claim that it has not been proven unsafe to drink. What has, unequivocally, been proven is that it makes it likely that your house will explode. Not to be crass about it, but, some very powerful entities, like mortgage holders and municipal officials, have a lot more concern about exploding houses than they do people’s individual health problems, which can be trickier to trace to environmental pollution. It’s not just about health of people…. although that should be our first concern, it often isn’t. It is also about the health of the built environment (on which the powerful collect mortgage interest and property taxes).